The ever-popular Too Loose Cajun/Zydeco Band rocks the house in the Portland area with their infectious brand of Cajun and zydeco dance music from Southwestern Louisiana. Do the two-step to the sound of two fiddles, accordion, electric and acoustic guitars, piano, the traditional Louisiana rub-board, and a kickin’ rhythm section. 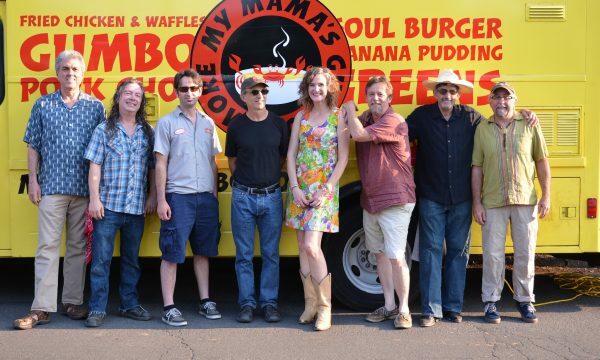 With their vocal harmonies tart and sweet, male and female, they are perennial favorites on the zydeco stage at the Waterfront Blues Festival, the Portland Mardi Gras Ball, as well as at area parties, weddings and festivals. So come on down, and bring your dancin’ shoes. Peter Dammann is a legendary Chicago-born blues player who recorded chart toppers with The Paul DeLay Band for nearly 20 years. Steve Kerin, raised in the heart of Cajun Country, is heralded as the west coast’s very own ‘Louisiana Lightnin’ on keyboards as well as Too Loose’s soulful vocal storyteller. The charming Rick Obbink plays single row accordion, showing us what his granny taught him and more. Lefty Head is arguably the best country Cajun fiddle player this side of Dooky Chase’s famous gumbo and just as tasty. Robert Lee showcases his languid & striking melodic fiddle style, a pleasing compliment to the band’s vibrant & danceable sound. Jennifer Smieja brings her keen sense of style and rhythm to the traditional zydeco vest frattoir, as well as her heartfelt Creole French vocals to the stage. And holding court in the rhythm section are the inimitable Tom Goicoechea & Tim Shaughnessy. Tom’s drumming talent has been recognized by legendary names too numerous to mention, while bassist Tim lays down the lines, and thus the launching pad, for Too Loose to create its compelling brand of Louisiana music. Too Loose is based in Portland, Oregon and keeps dancers & fans of the Cajun/zydeco music world coming back for more.